While a left leaning liberal, I Will Not Support Hillary! Under President Clinton, Dan Glickman became secretary of agriculture in 1995 and settled the class action discrimination suit of Pickford v. Glickman in 1999. Mike Espy in 1994 his last and only year as Secretary also a lawyer promulgated into law the National Appeals Division (NAD) of the USDA. He followed the establishment by promulgating into law that NAD would not adhere to the federal rules of evidence. He was then replaced by Dan Glickman. Was the reorganization act, the creation of NAD, the replacement of Espy a conspiracy to protect the USDA from legal liabilities, as they used USDA farm loans to gobble up land to support Agenda 21 and NFTA objectives at the expense of Small American Farmers? Why have so many small farmers disappeared while mega farms grew and moved out of the country? Stop for just a minute and ask yourself these questions. Who gets involved in helping farmers with Government Administrative appeals? Who beneifits with a farmer going bankrupt? Who benefits in the Farmers loss of their farm land? Think maybe lawyers, courts, judges etc? President Clinton and Dan Glickman both lawyers put into place what I allege is an unconstitutional racketeering enterprise designed to steal the constitutional rights of farmers and protect USDA associates from accountability or responsibility for criminal acts. This racket is responsible for thousands of acts of judicial abuse and denial of civil rights. A Racketeering enterprise which I allege the Federal courts aided and abetted illegally and unconstitutionally to deny my lawsuit for racketeering and avoid a trial by jury in federal court. A racket the Federal Courts have aided for decades by granting unconstitutional deference to USDA agencies. The head of this enterprise is the current Secretary of Agriculture Tom Villisack who reports directly to the President. Think about these facts. The Secretary of Agriculture is operating a racketeering enterprise in violation of Federal Law and in violation of Governments constitutional obligation to operate legally and within the law and he or she reports directly to the President of the United States. Does that imply the President of the United States is actually the head of a criminal enterprise protected by immunity and seemingly protected and assisted by the Federal Judiciary? How can that possibly square with the Presidents sworn duty to uphold the law and the constitution? You can read about Hispanic farmers plight here Hispanic Farmers Fight to Sue USDA. You can read about new claims from Alabama Black Farmers Sue USDA. You can read about the discrimination suit of White Farmers at White Farmers Suing USDA/FSA. You can look at the history of discrimination claims against the USDA at History of Discrimination claims. (Note the White Farmers Suit was dismissed as White farmers cannot be discriminated against under existing laws.) I would suggest after reading these you read Breitbart’s Piggford Report: Distortions and Shady Sourcing. Then you can read about Andrews report being vindicated Better Late Than Never New York Times Confirms Andrew. I’m prepared to go to court and make my case before a jury, that in fact the USDA is operating a racketeering enterprise. But will the Federal courts ever allow it? The more I learn and find out about this operation it leads me to believe the USDA’s Farm Loan Program is actually a vehicle to launder under the table payoffs. There is no better way in todays environment to hide such payoffs than by making payments to principle or rolling over a mortgage loan hidden on a Government loan servicing system. Making mortgage payments is a common way to conceal bribes. How many congressman and Senators own or operate a farm? How involved is Monsanto in farming? How involved are other major companies in the commerce of Agriculture? How many former Government officials end up working for these firms or vise versa? How many legislators actually have USDA mortgages? How many legislators directly or indirectly receive farm subsidies? For a general idea on the last question read Farm Subsidies Paid to the Members of the 112th Congress It would also be nice to know this on the Senate. 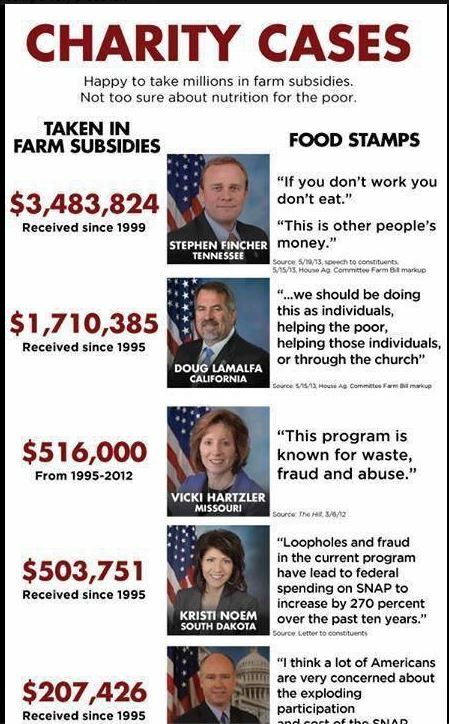 You can see more on our legislators in Taxpayers Gave 15 Members of Congress 238K in Farm Subsidies. Including Tom Villisack. How many Judges have farming operations would also be a great question. If you read through these links you will find articles by, Delta Farm Press, Ebony Magazine, Seattle Times, La Times, NY Times, Washington post. I have yet to have my story told in the media. I wonder where is the outrage over our Government operating a criminal enterprise to the determent, destruction, and despotic torture of its citizens? Where Mr. President is the Justice? I cannot conceive of anything that undermines the integrity of our nation more than the truth the U.S. Government is criminally operating against American Citizens aided by Federal courts ignoring the law and the constitution while destroying the foundations of this country. If you read Breitbart’s Piggford Report in its entirety it implicates President Clinton, Vice President Al Gore, and President Barack Obama. Today, I was made aware of Hillary’s plans for rural America. You can read them at Hillary Clintons’s Plan for a Vibrant Rural America However, if you read everything here I suggest you take a highly skeptical view of Hillary’s plan and wonder if its anything more than an attempt to buy votes from rural America or even something else more sinister. Its no secret FSA, NAD, USDA and the Federal Judiciary has used their racket to terrorize my family and I now since 2012. Update 2-25-2016 Take a close look at this video Hillary will say whatever she thinks is the right message to get elected. Why does she want it so bad? Hillary Clinton in Black History. Lets not forget President Clinton also signed into law the repeal of Glass Steagall, which likely was the root cause of the financial collapse, and subsequently Dodd Frank, and consequently, the destruction of my life’s work. Therefore, I would have to say President Clinton’s presidency killed the American dream for my family and I.See What is Glass Steagall. On a slightly different note my journey through the court system has educated me to the nationwide epidemic in Judicial corruption. I have petitioned the White House to reform the Judiciary as demanded by Article 2 Clause 5 of the Constitution of the United States. Please take time to sign this petition. Petition Link and here is why: Update 1-18-2016 Petition killed. 1 in every 110 people in the U.S. is a convicted Felon. As of May 2012, a total of 3,294 individuals had been appointed to federal judgeships. How many Federal Judges have there been in the last 225 years? Some how their average is extrodinarly better than the countries human average? You can read the complete text of Dr Richard Cordero’s analysis at this link: Exposing Judges Unaccountability and Consequent Riskless Wrongdoing. This is an issue of grave national importance and needs to be a topic on the platform of every Presidential Candidate. However, that will not happen unless the publics heart begins to beat to the tune of reform/revolution. Also you can tune in Tuesday-Thursday from 4 – 7 on twigscaferadio.com for Jasikoff & Friends, Sanity Check,and Justice served to hear from individuals experiencing these Judicial issues. I leave you with this thought. Corrupt Judges, train law clerks to become corrupt lawyers, who become corrupt legislators, making laws to corrupt, and appointing corrupt State judges. More often than not one of these lawyer legislators becomes President and then gets to appoint Federal Judges and Supreme Court judges who are voted in primarily by Lawyers turned legislators. This is the epitome of a good ole boy crony capitalist network. Is it an illuminati conspiracy? You have an obligation as an American citizen to become aware of the depth of this problem. Update 1-17-2016. September 28, 1820 Thomas Jefferson expressed his concerns about this very issue as he wrote in a letter to William Jarvis on the subject of Judicial review. Update 1-19-2016 Now look at this! If your into Illuminati theories look at this document on Bill Clintons Criminal Background and This Video on Hillary’s Criminal Background. I make no representation about the information in these links Everything else in this post is true to the best of my knowledge. UpDate May 15, 2016 Rothchilds hold 100,000 a plate fundraiser for Hillary Clinton. Think very hard about whether you want another lawyer in the White House. Consider carefully all the legal questions raised about Bill & Hillary’s past and the perception they lie both have backgrounds as lawyers. I hope the country will not take the chance with Hillary and vote for Bernie! Update 1-22-2016 TTIP European Farmers have discovered TTIP is very bad for small farmers. Is it all part of the plan. Wipe out small farmers by ruining their business then take their land for UN Agenda goals, Gift agriculture to big Ag and bio engineered chemical companies like monsanto? Read how TTIP is seen affecting EU agriculture. Down Fall of European Agriculture. Update: 1-14-2016 See why Anonymous just endorsed Bernie Sanders> Anonymous Just Announced Who They Support for President. Update 1-26-2016 There is more you need to know about this coming in the next bloq post. Update 1-29-2016 My motions to the court as well as the DOJ’s Councils notice of appearance have not been docketed. My motions which have not been answered requested the Judges attest to haven taken the judicial oath of office and to adhere to that oath through out the proceedings. The dishonorable Judge Jackson L. Kiser once threatened to refuse to docket any motion I made. Perhaps the condition is contagious! Pehaps its simply an admission of guilt. Update 2-12-2016 – Note read this article “Victims of the Federal Bootprint” and realize the racketeering enterprise USDA is operating is all about denying people their Due Process Rights. How many other agencies are doing the same. CB Julian Not a Pro Pro-Se per se. This entry was posted in Federal District Court and tagged #FeelTheBern, Corruption, FSA, FSA.USDA, nad. Bookmark the permalink.